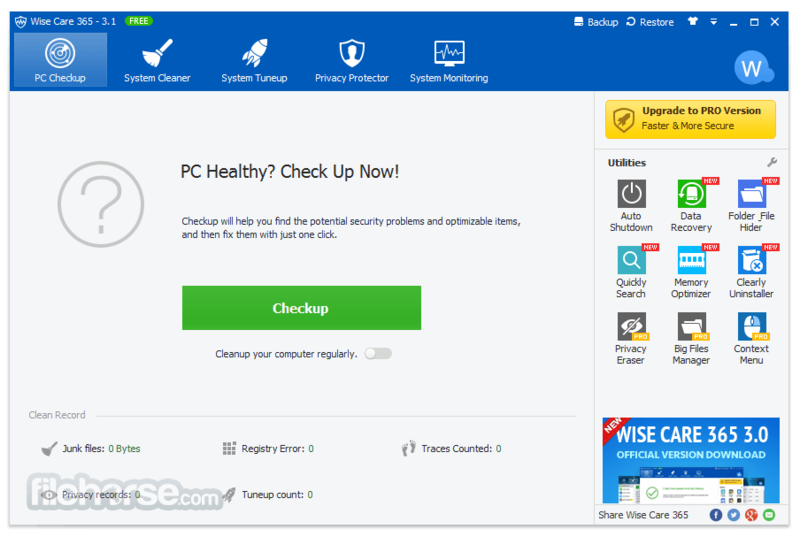 Wise Care 365 provides the best solution to improve your Windows PC's performance. It not only promises a dead easy use but also brings the advantage of full-featured, practical and economical. With its help, your computer will never run slow again! 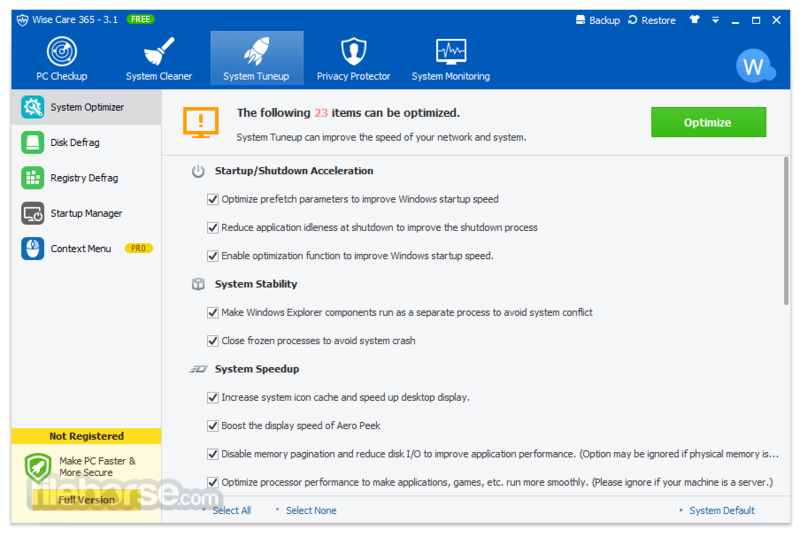 Wise Care 365 is an all-around Software to Optimize and maintain your Windows performance. The program is definitely the preferred option for billions of Windows users who want to keep their Windows PC at peak performance. It removes invalid Windows registry entries and cleans useless files, download history, browsing history, invalid shortcuts, traces, cache, cookies, passwords, Windows components, and files with specific extensions - allowing Windows system to run faster and freeing up more valuable hard disk space in seconds. It is also packed with customizable cleaning options for advanced users. Wise Care 365 Free adopts world’s top technology. 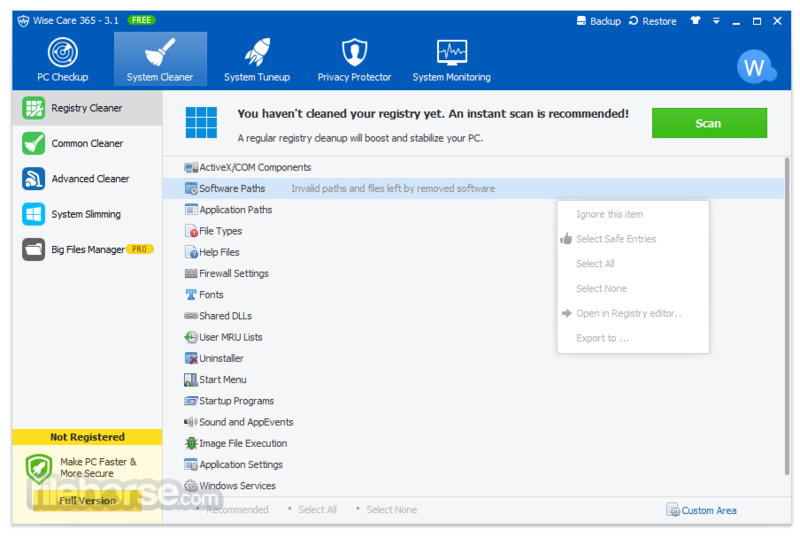 It optimizes PC's performance, defrags disks and the Windows registry, and manages the startup process as well as services. Over time, your computer’s hard disk drive and registry will become cluttered. Wise Care 365 can defrag the drive and registry to make them organized, thus making your computer run faster and more stable. You are going to be amazed by its blazing defrag speed. Many programs run silently in the background when you start up your computer. It helps you disable unneeded programs that consume your precious system resources and improves PC startup speed. The program protects your computer privacy from prying eyes. Privacy Eraser erases all traces of any computer operation like browsing history and accessed files, so any computer operation you do stays confidential. Disk Eraser prevents deleted data from being retrieved by third parties. Disk Shredder can delete files thoroughly so that they can never be recovered. System Monitor displays all the essential information of your computer. 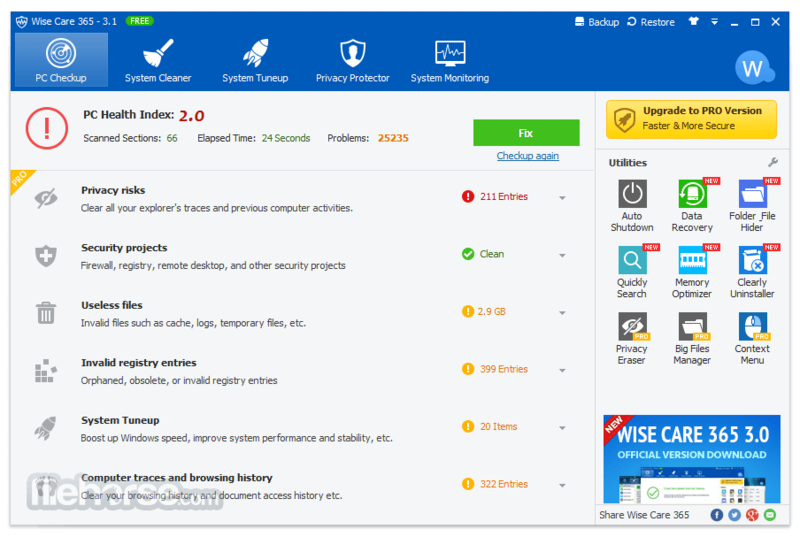 Process Monitor gives users a clear and neat list of all the processes run by user and system, users can shut down any process they don’t need to make the PC run more smoothly. Hardware Overview offers users both brief and detailed information of all the crucial hardware components, letting users know about their computers at a glance. The ‘Wise Assistance’ section of Wise Care 365 Free is a community for mutual assistance and knowledge sharing on PC problems. Users can ask any questions about their computers, while experts and other users with relevant knowledge, experience or techniques will answer these questions. It holds millions of users across the world, so users can get faster and better solutions. It is a connection between users and experts to get faster and better solutions for computer problems. Note: Limited functionality in free version.